GS Yuasa International Ltd., a Japanese battery manufacturer, offers two solar latern products: the AKARi Solar Light Kit and the Mini Moshi-Moshi. 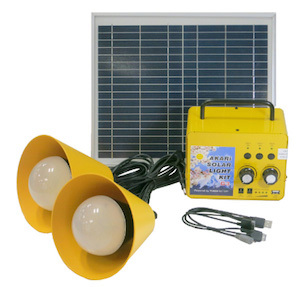 The AKARi Solar Light Kit is a small-sized solar power system for household use equipped with one of GS Yuasa's batteries. By charging the battery during the day using the solar panel, it is possible to use LED lights and charge mobile phones during the night. When full, the battery will provide upwards of 5.6 hours of lighting / charging. The product is equipped with two LED lights and a USB charging terminal. Similar to the AKARi Solar Light Kit, Mini Moshi-Moshi uses a solar panel and battery. This products is capable of charging five mobile phones at the same time with each of the five USB terminals. The Mini Moshi-Moshi is equipped with one LED light and can provide 10 hours of lighting / charging on a full battery. Both the AKARi Solar Light Kit and Mini Moshi Moshi are under warranty for 12 months with a valid warranty card.